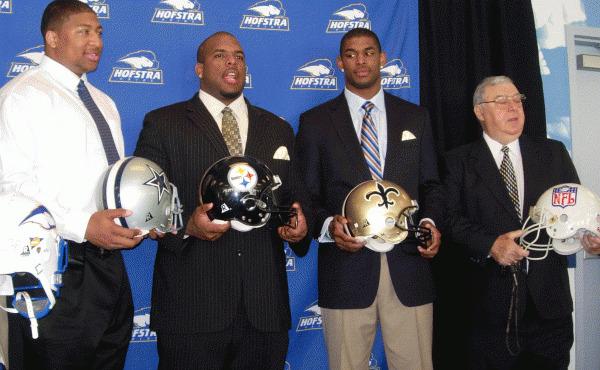 NFL players Stephen Bowen (l. to r.), Willie Colon and Marques Colston stand with Joe Gardi at a Hofstra press conference in 2006. Another month passes by and yet another tragic occurrence in the Hofstra athletic department arises. Former legendary head football coach Joe Gardi passed away Wednesday, following a stroke last week. He was 71. Though his passing is a different loss to Hofstra, it adds to what seems like a never-ending dark cloud hovering over the Hempstead campus. The football program was disbanded in December, Tom Pecora left to coach basketball at Fordham, Tim Welsh was hired and fired after a drunk driving incident, and now this. While the other examples are far less important in perspective to the passing of a man who led the Pride football team for 16 seasons, you can’t help but think about the pattern. And while this column will mainly be about Gardi and his magnificent coaching methods on the sidelines at Shuart Stadium, let it be known that Pride Nation can’t take any more pain. As Sports Editor of the Hofstra Chronicle for nearly three years, I dealt with coach Gardi a handful of times. Thought of as a grandfather like figure to many, he was a kind and courteous man and made time for everyone – even the pain-in-the-neck school paper reporters. His record speaks for itself: 119-62-2. Between 1990 and 1994, Hofstra went from Division III to Division I-AA. He played college ball at the University of Maryland and had a brief stint with the Washington Redskins in 1960. His true calling was with a headset and eraser board, dishing out plays and managing personnel. He went from high school to college to the World Football League to the NFL and eventually Hofstra. His coaching career was wide traveled, but he felt most at home in the New York-Metropolitan area. After roughly nine seasons with the New York Jets, in which he served in various coaching capacities, he was an assistant supervisor of officials in the NFL. 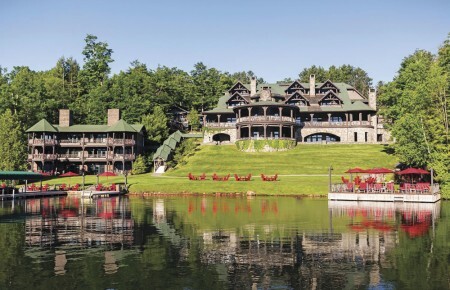 Hofstra became a power under his guidance. It never won a national title during his time or garnered major national headlines, but every year players were being considered by professional teams and Gardi’s legend will live on in gridders like Marques Colston (Saints), Willie Colon (Steelers) and Stephen Bowen (Cowboys), among many others in the Arena Football and Canadian Football Leagues. Many of Gardi’s former assistants are making their mark as well: Raheem Morris (head coach Buccaneers), Dan Quinn (defensive line coach Seahawks), Joe Woods (defensive backs coach Vikings) Chip Garber (defensive coordinator Toronto Argonauts) and Jamie Elizondo (offensive coordinator Toronto Argonauts). It’s a sad day for Hofstra sports fans, and supporters. Though football has been whipped from the scrolls on the University, administration should strongly consider honoring him with a statue or something else of significance. It’s the least they could do after taking away the program he worked so hard to build up. Gardi is survived by his wife, Audrey, two grown children Joanne and David, daughter-in-law Michele, four grandchildren and the thousands of players, fans and co-workers that new him well.